CHILDREN'S ANNUALS AND TV AND MOVIE RELATED COLLECTABLE BOOKS . Books published in connection with Television and movie merchandising campaigns, as well as children's annuals and screenplay novelisations of children's shows. VG+ apart from gift inscription to first page is near fine. Fleetway/ IPC 1979 pictorial boards, large 8vo, 127pp. Tharg, Robusters, Dan Dare, Judge Dredd and more. ISBN 850373913. 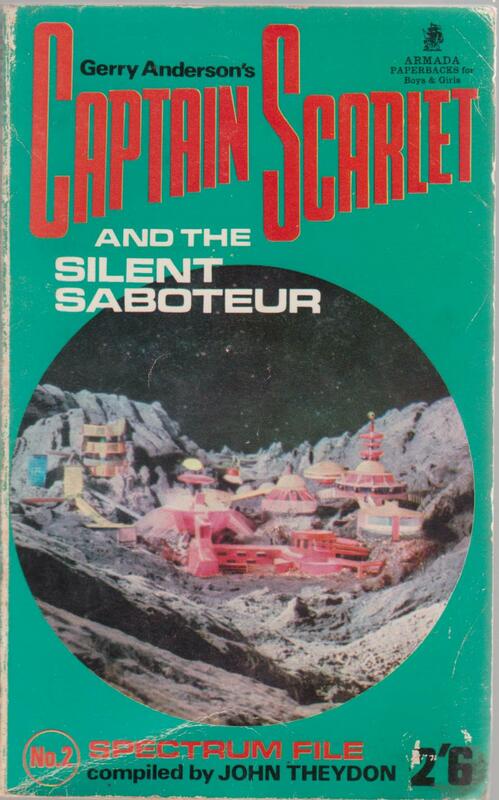 Novelisation from the 'Supermarionation' TV show by Gerry Anderson. G+ paperback with rubbing to spine and book edges. Mild foxing to edges. Mayfair/ Armada 1967 first edition, 128pp. G spine rubbed and split at ends, tape residue at head and tail, name to first page,light crease to covers. Mayfair/ Armada 1966 first edition paperback, 127pp. VG name to first page, hrad of spine slightly pulled. VG bumped corners, light wear tail of slightly sunned spine, name to paste down. VG- front hinge loosened with tape residue, first two leaves detached but tidy, name and address to both paste downs. VG hinges a little opened,name to both paste downs. VG light wear to spine ends, owners details to title page, crossword completed with green ballpoint. VG name and address to inside of front cover. World 1980 pictorial boards 4to, 62pp. Whitman Authorized TV Adventure Western Publishing 1969 first edition pictorial hardcover 8vo, 210pp. Whitman Authorized TV Adventure Western Publishing 1966 first edition pictorial hardcover 8vo, 214pp. Whitman Authorized TV Adventure Western Publishing 1966 first edition pictorial hardcover 8vo, 212pp. VG unclipped, edge wear to boards. G+ rubbed edges especially at the corners which are frayed, name to fep. Whitman Authorized TV Adventure Western Publishing 1967 first edition pictorial hardcover 8vo, 214pp. VG- rubbed edges and joints, gift inscription to fep. Whitman Authorized TV Adventure Western Publishing 1966 first edition pictorial hardcover 8vo, 210pp. VG- head and tail of spine worn and taped at head, owners details to first page. Brown Watson 1976 pictorial boards 4to, approx 70pp. Includes Bruce Lee as Kato from Green Hornet in Carradine's 'Kung Fu Quiz' and also a piece of Kung Fu with photos of Bruce Lee. VG- pulled head of spine taped, corners rubbed, owners details to first page. World Distributors (1967) pictorial boards, 94pp. Full size 4to annual. VG a few small nicks to spine. VG small name to paste down, small stain to top edge of pages. Adprint 1950 first edition thus laminated pictorial boards, 246pp. G+ lacks bottom third of spine otherwise tidy copy with owner details to fep. VG- head of spine pulled and tape reinforced, owner details to head of title page, one page pulling from spine at bottom half, spine leans. Whitman Authorized TV Adventure Western Publishing 1968 first edition pictorial hardcover 8vo, 210pp. Another copy available has pen name to fep. Whitman Authorized TV Adventure Western Publishing 1970 first edition pictorial hardcover 8vo, 208pp. VG minor rubbing to edges and surface of boards. Whitman Authorized TV Adventure Western Publishing 1967 first edition pictorial hardcover 8vo, 212pp. Whitman Authorized TV Adventure Western Publishing 1969 first edition pictorial hardcover 8vo, 212pp. G rubbed edges, front joint loose, name to reverse of fep. Whitman Authorized TV Adventure Western Publishing 1968 first edition pictorial hardcover 8vo, 210pp. Fleetway/ IPC 1979 pictorial boards, large 8vo, 127pp. Strontium Dog, Ro-Jaws, Captain Condor, Time Quake and more. ISBN 850375037. VG crossword completed in ballpoint. Stafford Pemberton 1977 pictorial boards 4to, 61pp. From the British science-fiction television show. Fleetway 1980 pictorial boards 4to, 127pp. VG corners and head of spine lightly rubbed or chipped, unclipped title. Brown & Watson 1978 first edition pictorial boards 4to, 60pp. Based on the TV series based on Nicholas Freeling's novels. D C Thomson pictorial laminated boards, 127pp. War stories for boys in comic strip format. VG some light pencil to one of the puzzles. Puffin 1976 first edition pictorial boards 4to, 93pp. Collection of stories, articles poems, games and artworks. Contributors include Ursula Le Guin, Norman Hunter, Noel Streatfeild, Jill Paton Walsh, Joan Aiken.